Our goal when we breed is for our dogs to have excellent genetics, temperament, structure, conformation and the ability to perform! 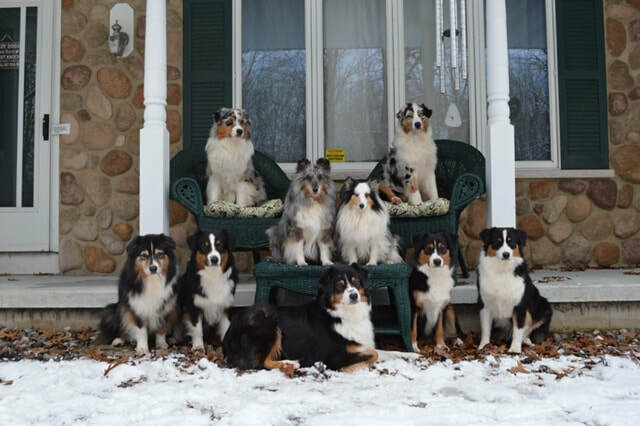 ​We are a small breeder in Sobieski, WI. We strive to produce and preserve the Aussie breed standards. Our main focus is temperament/personality, genetic soundness with hips and elbows checked - OFA'd, eyes checked - CERF'd, MDR1 tested, Thyroid - OFA'd complete health exams, intelligence, beauty and the ability to perform. Our dogs are very versatile performing in conformation, rally, obedience, and agility. Some have dabbled in herding, barn hunting, dock diving and also many are helpers in the 4H dog training program, which helps kids be responsible pet trainers. Our dogs are now making visits to a nursing home/assisted living center and doing therapy work. 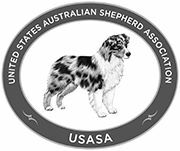 Our kennel is registered with ASCA and we are members of ASCA and USASA. We register all of our dogs with ASCA and AKC, plus several with UKC. Our puppies have health exams, vaccinations - distemper and bordetella, are de-wormed four times, micro-chipped, eyes cleared, tails docked and dew claws removed. Puppies are raised in our home and are very well socialized from birth until they leave our home at 9 weeks old, including our dogs, our pet sitting dogs as well as family and friends. In 2016 we started our puppies on "Puppy Culture" training. Our puppies and dogs come with a health guarantee. If something does not work out with a BlueRain puppy\dog, they must come back to BlueRain, no questions asked. Please note that our dogs\puppies are only available to approved homes. We do reserve the right to not place one of our dogs\puppies if we do not feel it is a perfect fit or match for both the dog\puppy or family. We do have a spay\neuter contract for non show homes. Please enjoy your visit to our website and contact us with any questions.